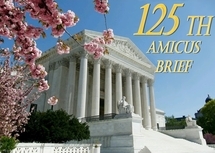 Justice Antonin Scalia questions and former Solicitor General Ted Olson responses during U.S. Supreme Court Oral Argument in Hollingsworth v. Perry (March 26, 2013) pp. 39-40. Dissenting Opinion of U.S. Supreme Court Justice Elena Kagan in Janus v. AFSCME, 585 U.S. ___, 138 S.Ct. 2448 (2018). “It may not be amiss, in the present case, before examining the constitutional question, to notice the course of legislation, as well as expressions of opinion from other than judicial sources. In the brief filed by Mr. Louis D. Brandeis for the defendant in error is a very copious collection of all these matters, an epitome of which is found in the margin…. Justice Oliver Wendell Holmes, Jr., writing for the majority in Buck v. Bell, 274 U.S. 200, 207 (1927) that compulsory sterilization of intellectually disabled persons did not violate the Due Process Clause of the Fourteenth Amendment. Note that he equated the government’s justification of compulsory vaccination with compulsory sterilization. Such laws were based on the “science” of eugenics that swept the country’s elites in the early part of the last century. Only Justice Pierce Butler dissented from the Court’s decision, and he did not bother to write a dissenting opinion. This case has never been overruled by the U.S. Supreme Court. Justice Robert H. Jackson (1892-1954), West Virginia State Board of Education v. Barnette, 319 U.S. 624, 640-41 (1943). Dissenting Opinion of Justice John Paul Stevens in Fullilove v. Klutznick, 448 U.S. 448, 534 n.5 (1980), when he originally opposed the constitutionality of racial quotas — under the non-existent, mythical “equal protection component of the Fifth Amendment” — before he succumbed to the temptation of judicial supremacy, enticing him to believe that the U.S. Constitution had no fixed meaning, but was an evolving document which needed to be interpreted afresh by each generation by a bare majority of the nine unelected lawyers who happened to be then serving on the U.S. Supreme Court.